If there’s one thing Disney World knows how to do in style, it’s making sure guests have a Merry Christmas unlike any they’ve experienced. Case in point: they string more than 8 million Christmas lights over their parks. 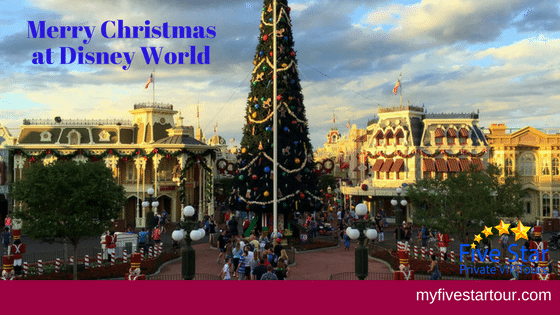 We’ve put together a special guide on all things Christmas and holidays at Disney World. Read on for an insider scoop on how to celebrate in style. The largest Christmas celebration at Disney is without a doubt Mickey’s Very Merry Christmas Party. This almost two-month party is packed with family fun, holiday cheer, and memories your children will treasure forever. From November 9th to December 22nd, Mickey’s Christmas Party takes over Magic Kingdom every day. Some of the jollier features include a Disney twist on classic holiday music, your favorite characters dressed for the festivities, and the Cinderella Castle twinkling in the winter air. Mickey’s Once Upon a Christmastime Parade is bringing a dance party down the center of Main Street. Expect cameos from Mickey, Pooh, Tigger, the Seven Dwarfs, Minnie, the characters from Frozen, and many more. There’s even a rumor Santa himself is making an appearance. A Frozen Holiday Wish, where Elsa, Anna, Olaf, and Kristoff take over the Castle Forecourt Stage. You’ll share in their adventure of love and get a front-row seat as Elsa eventually transforms Cinderella Castle itself. Last, but certainly not least, there are special in-room celebrations. These are one-of-a-kind gifts and personalized experiences delivered to your room by Mickey and Minnie themselves. While these special presents are a great way to celebrate the holidays, they do cost a little extra. One of Disney’s most beloved rides (sorry Pirates of the Caribbean!) is the Jungle Cruise. Every Christmas season, the Jungle Cruise transforms into its holiday cousin – the Jingle Cruise. The boats are decked out in lights, people dress up like old Saint Nick, and the skippers’ witty banter takes on some festive cheer. It’s a super fun experience both you and your children won’t soon forget. There were rumors that the Jingle Cruise wouldn’t make an appearance this year, but our inside sources have confirmed that it’s coming back to the Magic Kingdom just in time for Christmas 2017. One more jingle-tastic tip – make sure to pay special attention to the elephants, hippos, and other animals! Epcot, the multicultural mecca of all things amazing at Disney, isn’t letting Magic Kingdom steal the holiday show. Their annual Holidays Around the World festival is back this year as the International Festival of Holidays. The Candlelight Processional, which features a full orchestra and choir giving a powerful performance of the story of Christmas. The Holiday Kitchens of Epcot’s many countries where you can find mouthwatering seasonal recipes. Chip & Dale’s Christmas Tree Spree, where the classic Disney characters will be collecting ornaments for the Epcot tree. The International Yuletide Extravaganza, where you can listen to live music and watch a global tour of the holiday traditions of many countries in Epcot’s World Showcase. No Merry Christmas at Disney World would be complete without a stop at Hollywood Studios. They’re bringing the house this year with some serious holiday cheer down Sunset Boulevard. Flurries of Fun, which is packed with Jingle Bells, Jingle Bams, and even snow. Special holiday themed characters, including some Muppets, Mickey and Minnie, and beloved Toy Story regulars. If these all sound like a serious fun way to celebrate Christmas at Disney World, then you’re in luck. We’re the Disney experts and we can make sure your holiday cheer isn’t interrupted. From getting you to the parks in style, to festive lodgings, to exclusive tours and activities, we’re here to make sure your Christmas celebration is a one-of-a-kind memory for you and your children. Sound good? Then contact us today and check out our page on Disney VIP Tours.